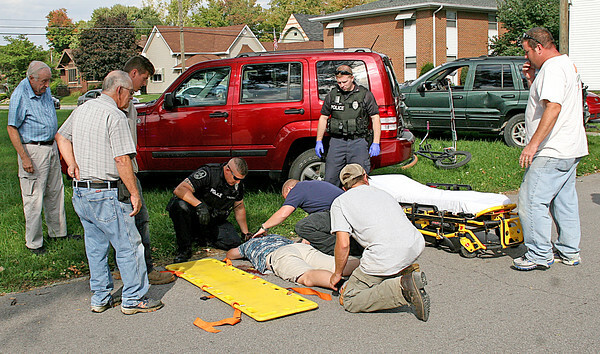 BICYCLIST INJURED: Police, Boone County EMS paramedics and passers-by care for a 15-year-old Lebanon boy who was struck by a red Jeep Liberty about 3:$7 p.m. Thursday, before he was taken to Riley Children's Hospital, Indianapolis, for treatment of head injuries. Police said the teen was riding the bicycle in background north on Lebanon Street when Paul Edlin, 73, Lebanon, pulled out of the Domino's Pizza lot onto Chicago Street. Edlin told police he did not see the bicyclist, officers said.